J Control Release. 2013 Oct 28;171(2):251-7. doi: 10.1016/j.jconrel.2013.07.017. Epub 2013 Jul 27. Maynadier M, Vezenkov LL, Amblard M, Martin V, Gandreuil C, Vaillant O, Gary-Bobo M, Basile I, Hernandez JF, Garcia M, Martinez J. 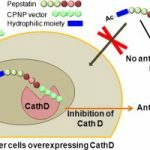 Implication of the intracellular proteolytic activity of Cathepsin D (CathD), a lysosomal aspartyl-protease overexpressed in numerous solid tumors, has been evidenced on tumor growth. 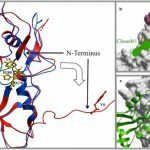 Its intracellular inhibition by potent inhibitors such as pepstatin constitutes a relevant but challenging molecular target. Indeed the potential of pepstatin as a therapeutic molecule is hampered by its too low intracellular penetration. 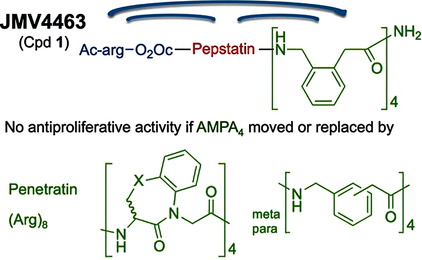 We addressed this limitation by designing and developing a bioconjugate combining a pepstatin derivative with a new vector of cell penetration (CPNP) specifically targeting the endolysosomal compartment. We showed that this pepstatin conjugate (JMV4463) exhibited high anti-proliferative effect on tumor cell cultures via intracellular CathD inhibition and altered cell cycle associated with apoptotic events in vitro. When tested in mice xenografted with breast cancer cells, JMV4463 delayed tumor emergence and growth. 9-Helix: 4-Amino(methyl)-1,3-thiazole-5-carboxylic acids (ATCs) were synthesized as new γ-amino acid building blocks. The structures of various ATC oligomers were analyzed in solution by CD and NMR spectroscopy and in the solid state by X-ray crystallography. The ATC sequences adopted a well-defined 9-helix structure in the solid state and in aprotic and protic organic solvents as well as in aqueous solution.